At some point, these continuous divergences between seasonally-adjusted extrapolations and unadjusted year-over-year comparisons will cease to provide so much apparent relief. Time after time, the smallest jump in the monthly variation is taken as cause for completely discarding all prior economic worries even though the more measured and consistent unadjusted growth rates continue to press downward; especially since time and again it is the adjusted “gains” that prove fleeting. Orders for long-lasting U.S. goods rose in July, and a key measure of investment posted the biggest gain in 13 months, a sign that companies continue to spend despite a tougher business climate. Durable-goods orders rose a seasonally adjusted 2% last month after a 4.1% gain in June, the Commerce Department said Wednesday. That was much stronger than Wall Street expected. Still, business investment remains relatively soft, down 3.8% from a year earlier. A stronger dollar has made U.S. exports costlier and harder to sell, a problem exacerbated by a weak global economy. American energy producers have also sharply scaled back spending on drilling rigs and other large equipment amid a plunge in oil prices. 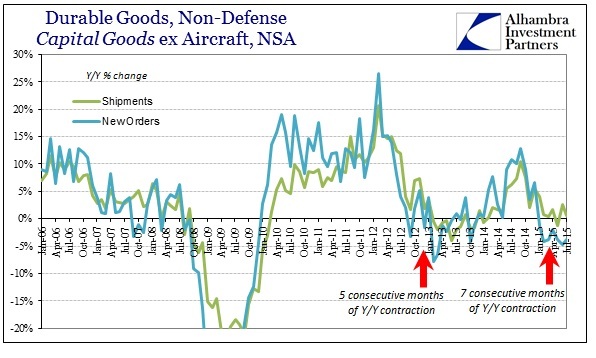 Even in the seasonally-adjusted series, durable goods orders are still down in the enlarging hole, equivalent to the level from December 2011 near the outset of the 2012 slowdown. The contradiction is stark, even from the same written piece; “continue to spend despite” followed just a few paragraphs later by “remains relatively soft.” Good thing stocks have become so unimportant else investors might be forced to square that circle. 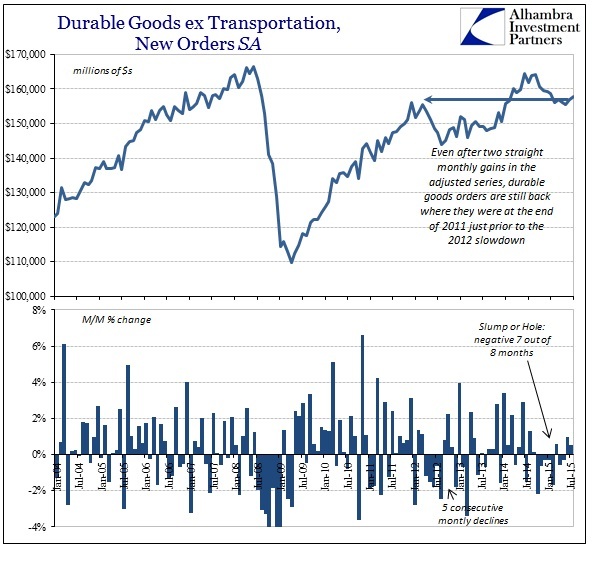 Durable goods shipments were down more than 2% year-over-year as new orders fell almost 3%. The decline in orders now stretches 6 months, with the 6-month average at -2.27%. That strain in orders has finally caught up to shipments, where the 6-month average in actual activity is negative for the first time in almost two years. 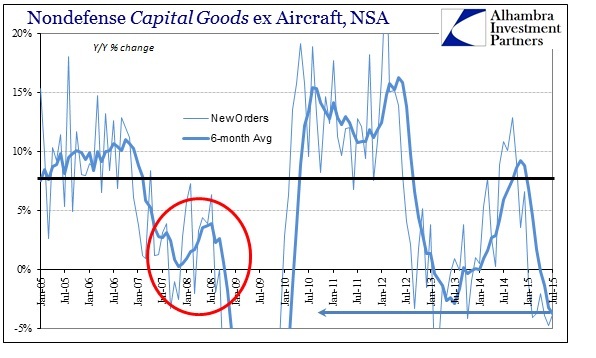 The slump in capital goods is even more pronounced as expected given the distinctly lingering oil collapse. However, unlike overall durable goods, the disparity between orders and shipments continues to grow. 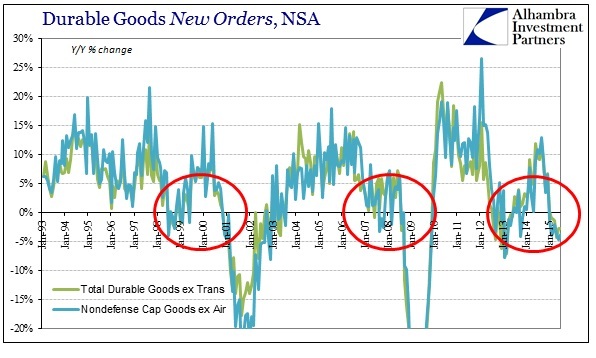 Capital goods orders fell almost 4% again in July, a full sweep of contraction for each and every month in 2015; shipments were instead positive though nearly flat, with the 6-month average of shipments of +0.77% set against an average in orders of -3.73%. That is the lowest six-month average of the “recovery” and equivalent on the way down to November/December 2008. There might only be confidence in this context to where it wasn’t worse, but as we have seen in so many other economic accounts following the “dollar” waves this pause or small bounce in June and July will not likely survive the renewed tightening of August. The major economic hole in the first part of the year was seriously deep, with the summer so far doing much too little to re-establish even the prior weakened growth trend. With the “dollar” rampaging once more it gives us a proxy on “demand” for the near term ahead, again transferring from “transitory” into something ongoing with no bottom yet and the heavy economic adjustments still to be fulfilled.